I. 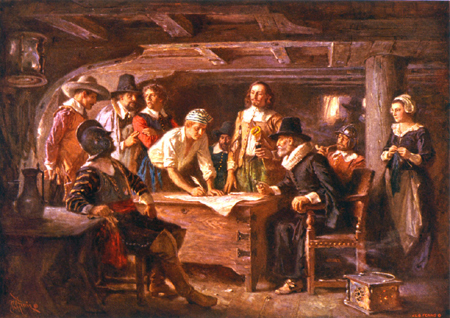 Why did the Puritans first come to the colonies? • Because they could live in stricter accord with those beliefs. The Pilgrims in November 1620 determined to live sacred lives according to biblical commands, and in so doing to build a “city upon a hill” that would be a beacon to the rest of the world. II. What kind of ideals did they bring with them? III. What is meant by the idea of “social contract? IV. What is meant by the term “covenant”? V. From what must a government derive in order to be legitimate? • From the consent of the governed. VI. Do ALL people have to agree with ALL the rules (laws) the government makes in order for them to be legitimate) Explain your answer. • Not all of them, just with the consent of those it claimed to govern.